It came to pass that Sarah had a baby boy just as God had promised. Abraham held a great feast on the day Isaac is weaned. Early the next morning, Abraham woke up and got some bread together with a skin of water and set it upon Hagar’s shoulder. Then Hagar departed and left Abraham. Hagar wandered in the Wilderness of Beersheba. The water Abraham gave Hagar was all gone. 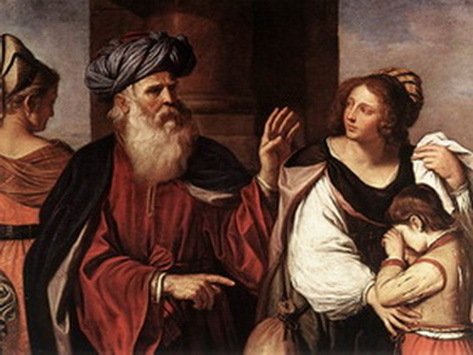 Hagar didn’t know what to do so she put her son, Ishmael in a bush. Then Hagar sat down at a distance and cry because she did not want to see her son die. God opened Hagar’s eye and Hagar saw a well of water. Hagar was so happy. She went to filled the skin of water and give it to Ishmael. God was with Ishmael. When Ishmael grew up, he became an archer. Ishmael stayed in the Wilderness of Paran. His mother, Hagar, get a wife from Egypt for him.